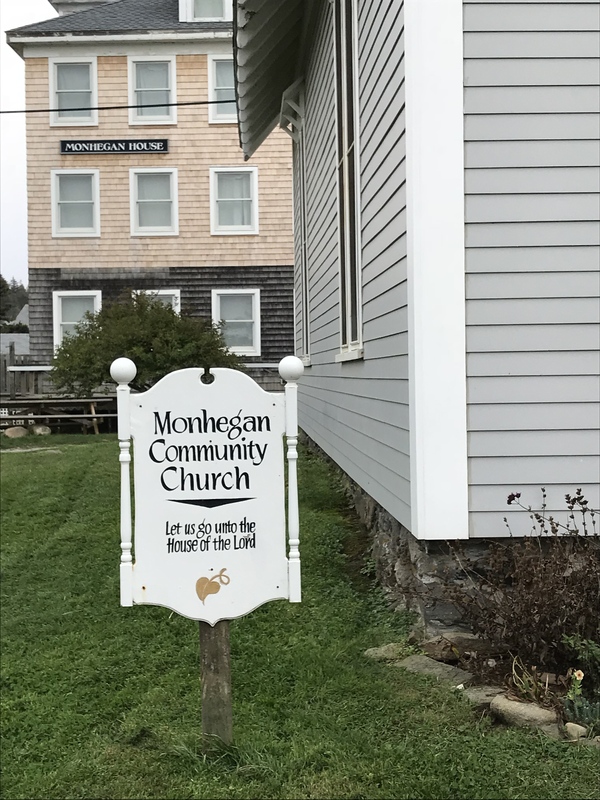 Five places to see: Monhegan Island, Maine | Oh, the Places We See . 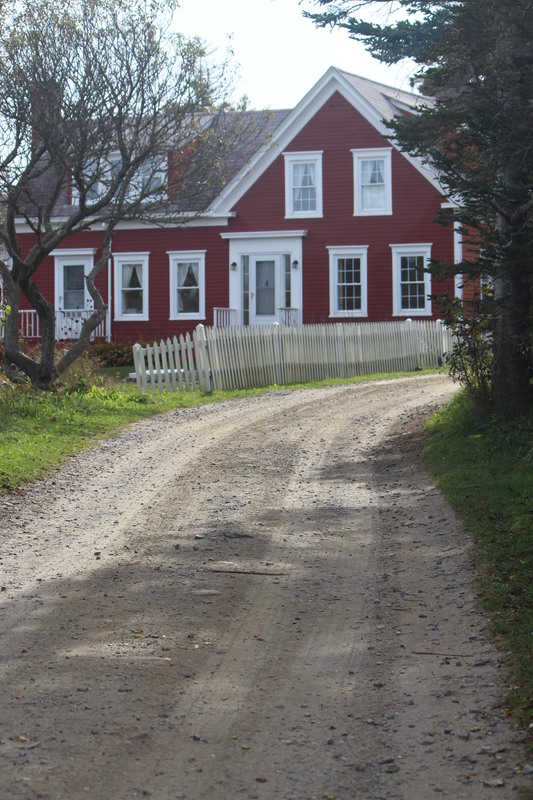 . .
Main road in Monhegan – pleasantly untouched. It’s no wonder artists and writers hole up in Monhegan. The entire island could fittingly be called “land that time forgot.” Weathered gray shingled houses, grass growing through piles of lobster traps, dirt paths proud to be left alone — it all adds up to the lure of a scene you can’t make up nor one that you can quickly forget. Not that you’d want to. From lighthouse hill: a view of the town of Monhegan. Dominating the landscape: The Island Inn. But also noticeable — the red house among the grays. 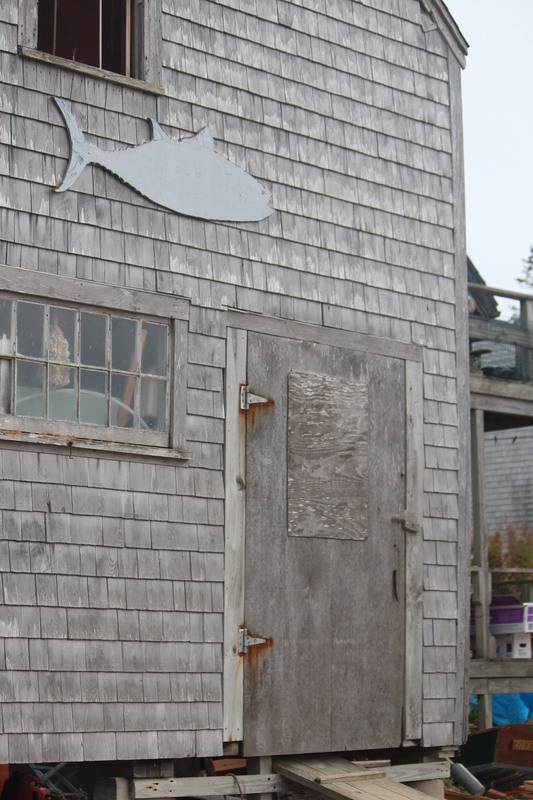 A day spent on Monhegan, even a week, may not be long enough. But if you visit in October — after Columbus Day — you don’t have to fight crowds or residents or anyone, for that matter. You almost have the island to yourself. The owner of Shining Sails graciously rented a room to us after tourist season, adding sage advice: “Bring everything you need. Nothing is open. No restaurants, no coffee shops, not even the lighthouse museum or the library. Everyone’s shut for the season. Pack it in. Pack it out. 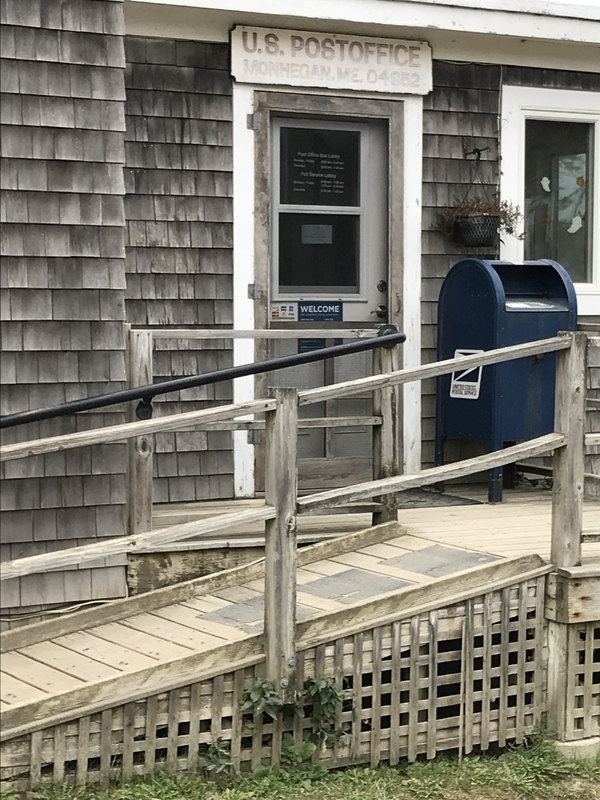 No public trash cans on the island.” And we believed her, packing the basics for dinner in our room. Sage advice for our trip came from Shining Sails, the only inn we found to be open. 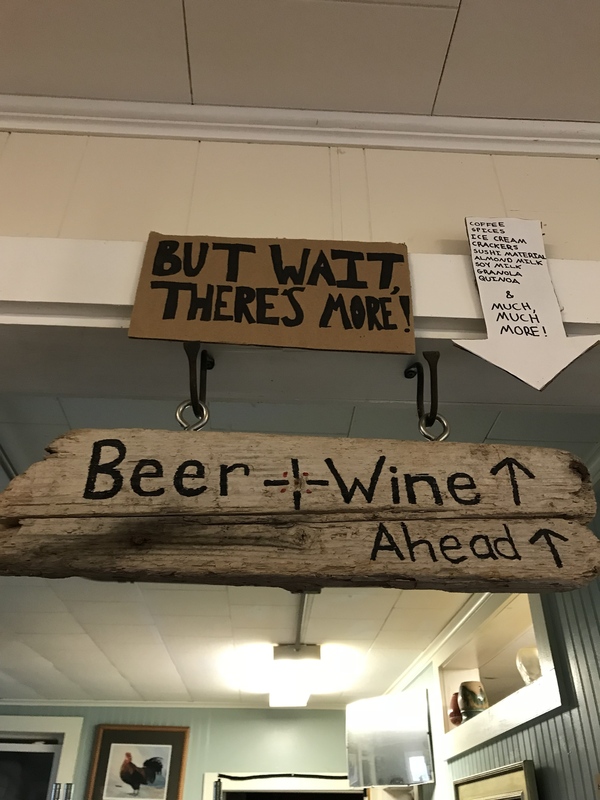 But even with the promise of an almost-deserted island, we found five great places to see on Monhegan in 24 hours. But tourists aren’t the only thing landing here. Think food, furniture, fishing gear — well, you get the picture. 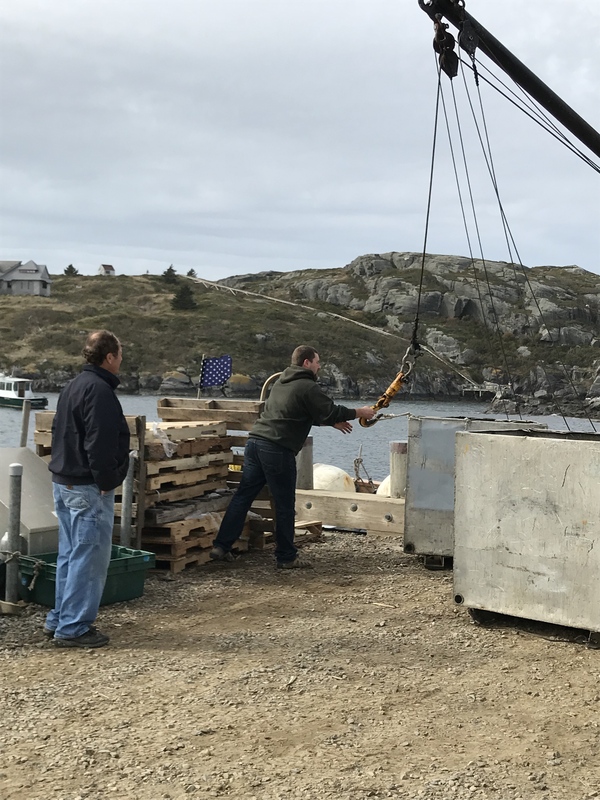 Everything that comes in or goes out moves across this hard-working dock, the unequivocal hub for loading/unloading and checking up on what — and who — is new. 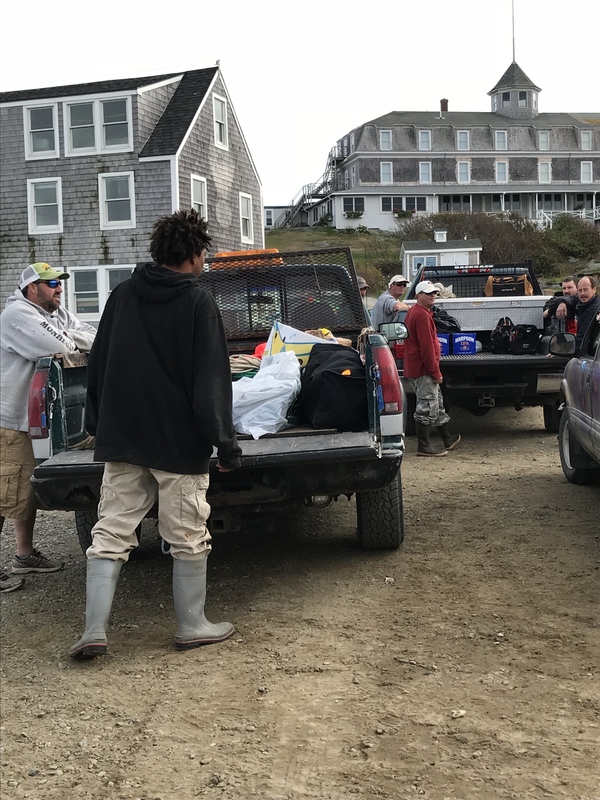 Monhegan Dock can be a welcome center, but it also doubles as a place for teary send-offs like this one when year-round residents put the summer museum curator on the boat to winter-over at home. She promised to return when the lighthouse re-opens. Permanent residents waving good-bye to the summer curator of the lighthouse museum. Ten miles out of Monhegan, we leaned over the rail of the Laura B to get our first glimpse of homes on Monhegan. They were different, of course. And nothing like what we expected. Stiff-legged houses balanced on stilts lined the shore. And up the hill, firmly planted, gray-shingled homes blended in with the landscape. Sitting right on water’s edge, a gray shingled house balances on sturdy legs. Some homes were unadorned. Plain, in fact. 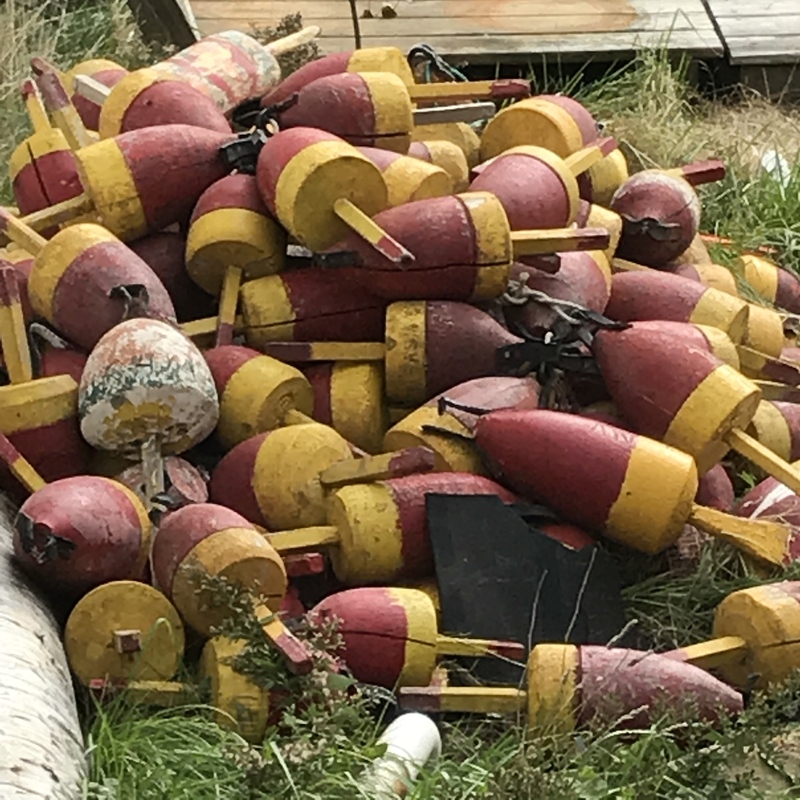 Others looked abandoned with their cast-aside-til-another-day traps and chains and unpretentious boats piled up in yards that rarely get mowed. 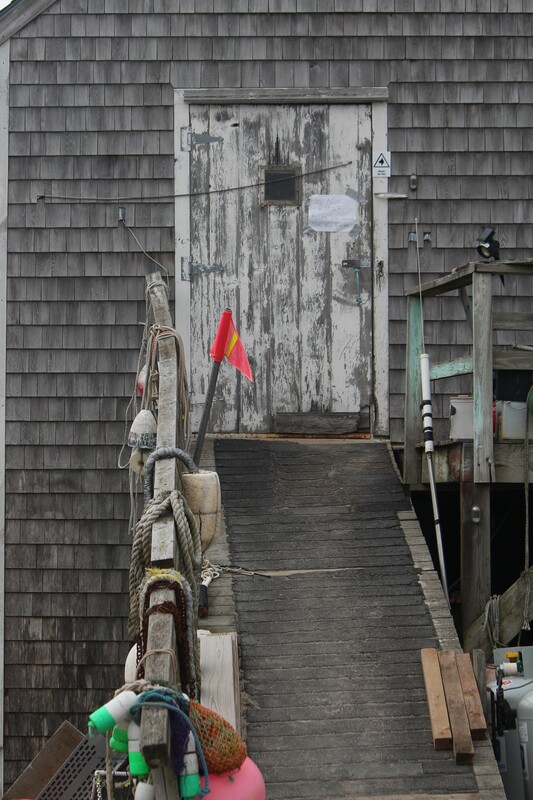 But some had the New England charm you might see on Cape Cod or Martha’s Vineyard. 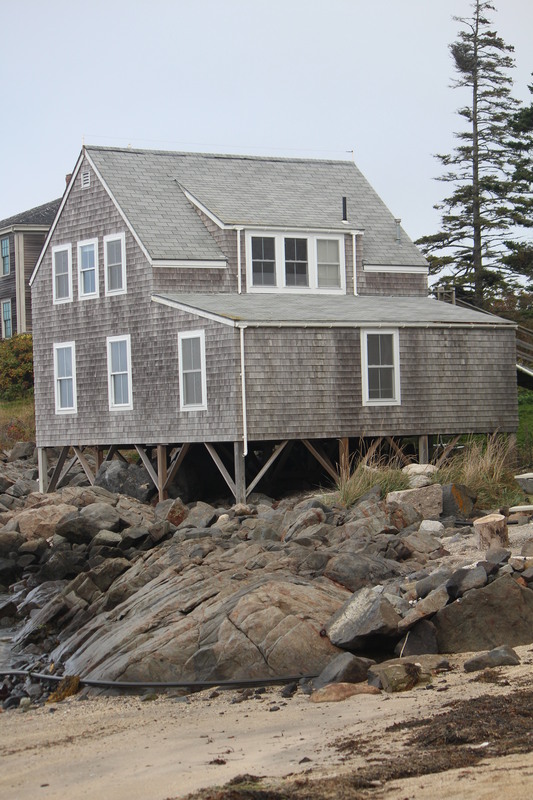 With remnants of the sea in its front yard, this propped up house holds its own near the dock. Red cottage with fencing on the path to lighthouse hill. 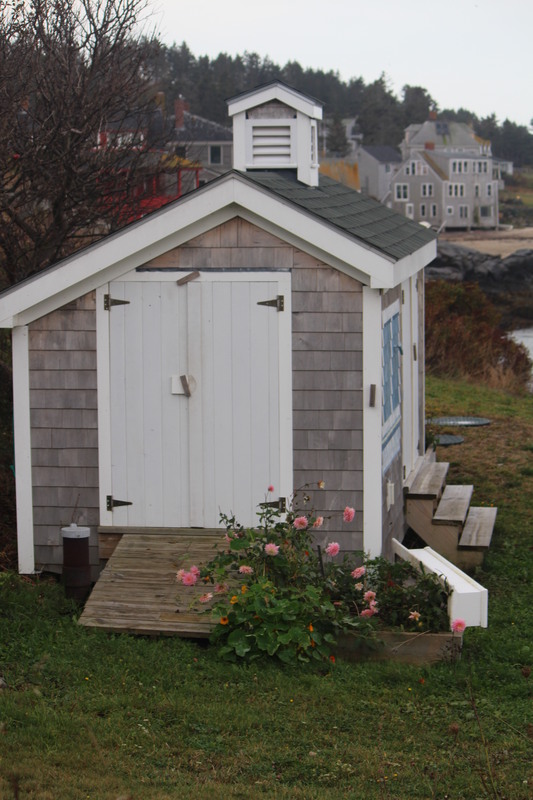 Sweet shed near the dock with pink flowers still in bloom. 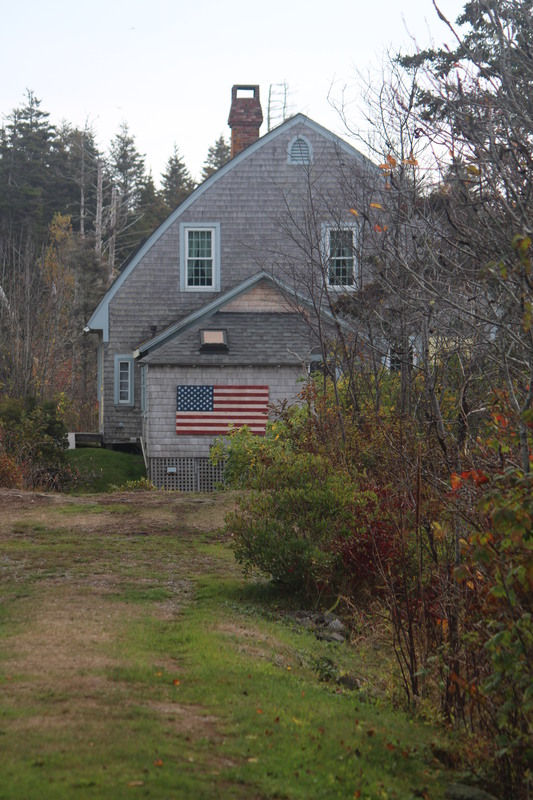 Gray Cape Cod home with American flag — on the way to Lobster Cove. 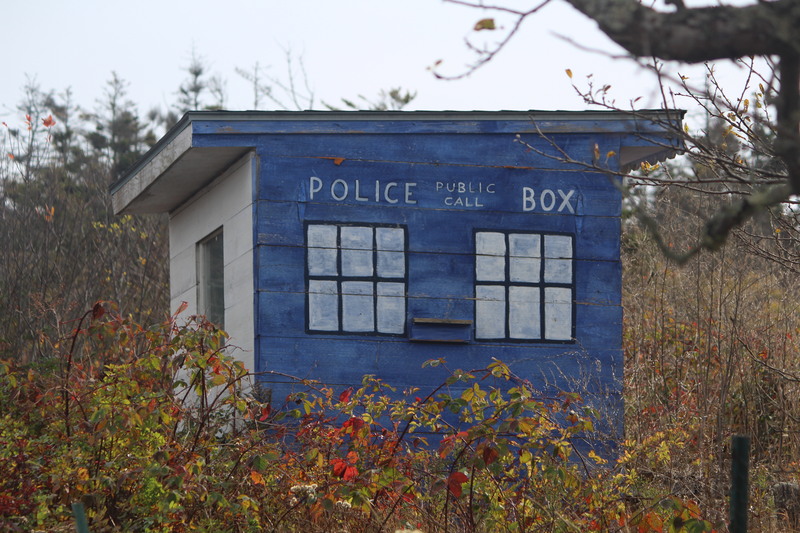 Island humor: shed painted as Police Box. The quintessential shape and color: gray shingles, white window trim. 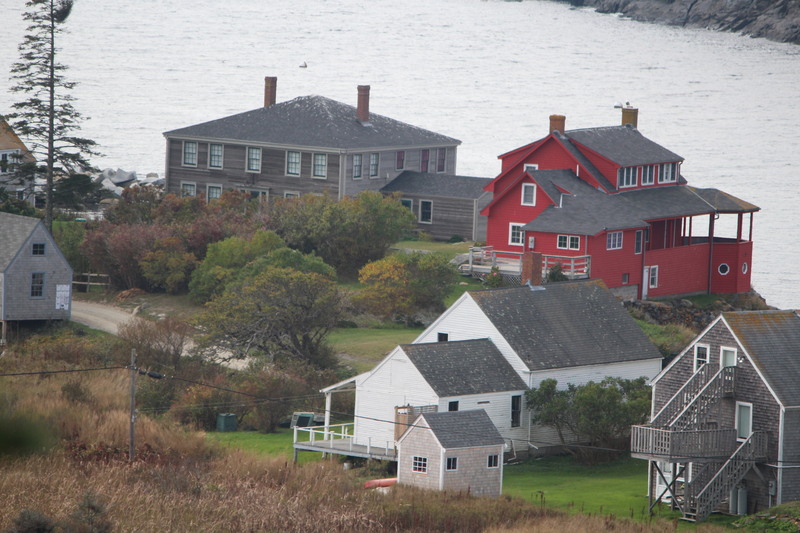 The red house as seen from lighthouse hill. 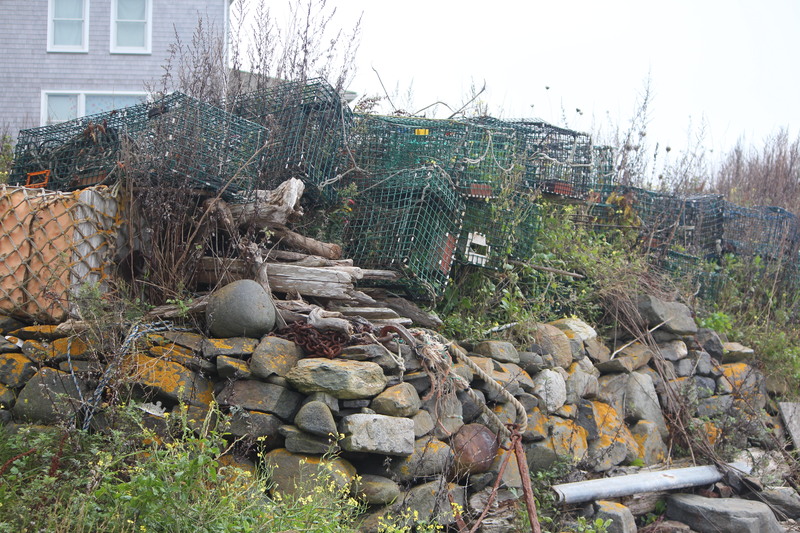 Been there a while — lobster traps and boulders on Monhegan. Blending in yet standing out, The Island Inn caught our attention right as we landed. The 32-room hotel revamped in 1910 was hard to miss. 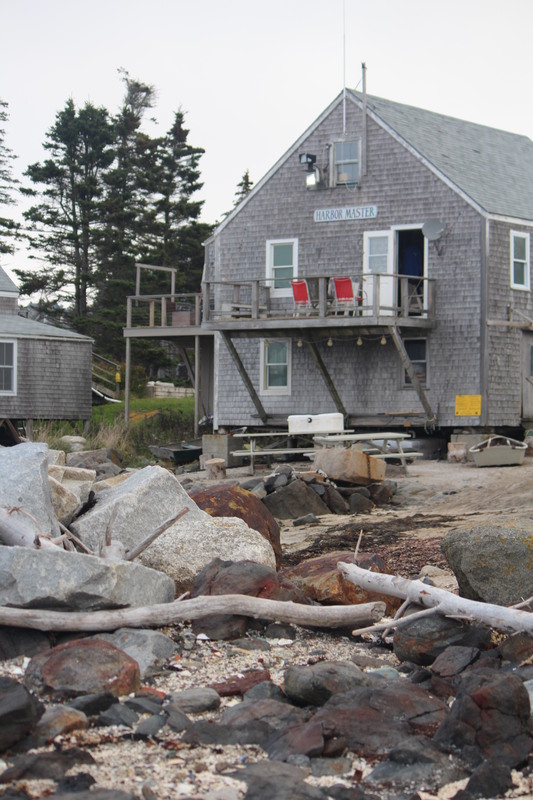 Looming from behind the seaside houses: The Island Inn of Monhegan. Normally fairly crowded, this well-worn path to Lobster Cove becomes a place of quiet after Columbus Day. Visiting Monhegan without hiking to Lobster Cove would be like touring Maine without seeing a lighthouse. Two-thirds of the 700-acre island is conservation land with 12 miles of walking trails. The trek to Lobster Cove is only half a mile with one relatively steep climb up Wharf Hill Road (not marked, by the way). Located at the south end of the island, Lobster Cove is home to a shipwreck, a site well-marked with a wooden cross adorned with a ring of coiled rope. According to “1-Minute Hike: Lobster Cove on Monhegan Island,” the 110-foot tug D.T. Sheridan was declared a loss by Coast Guard authorities after grounding at Lobster Point on November 8, 1948. Photographers and birders love Lobster Cove for its completely natural state, but tourists are warned not to swim since undertow and high waters can be quite hazardous. 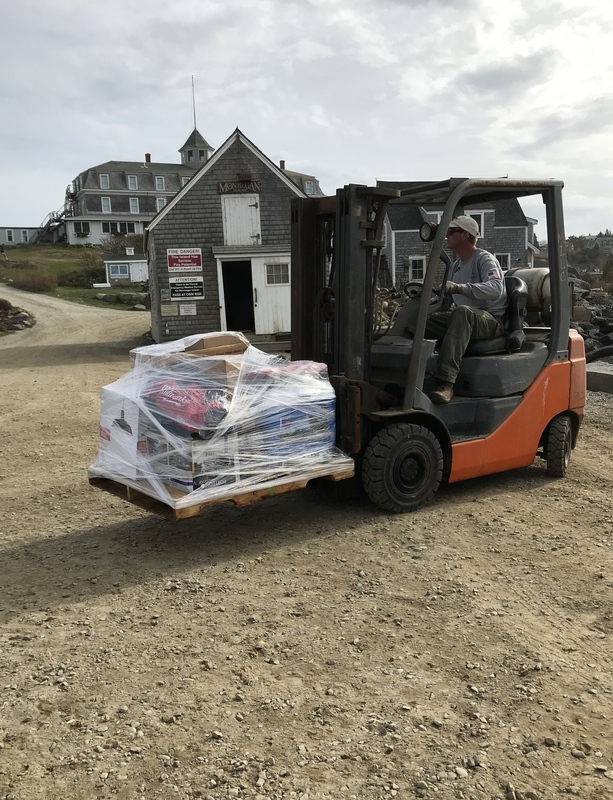 As we strolled the dirt paths and gazed at remnants of lobster buoys and traps leaning against unoccupied homes, we wondered if there even was a Downtown Monhegan. But collectively the little buildings form a downtown like no other. At one end of the “main street,” a solitary white schoolhouse stood calmly on a hill, proud to house its five students, soon to be four. Nearby was the library whose inside belies the feeling that this is a mere small structure. It’s not. Tomes both new and old line the walls from floor to ceiling. Then there was the general store. (Thank goodness!) We can be “packers” on an island, but oh, how we missed morning coffee! 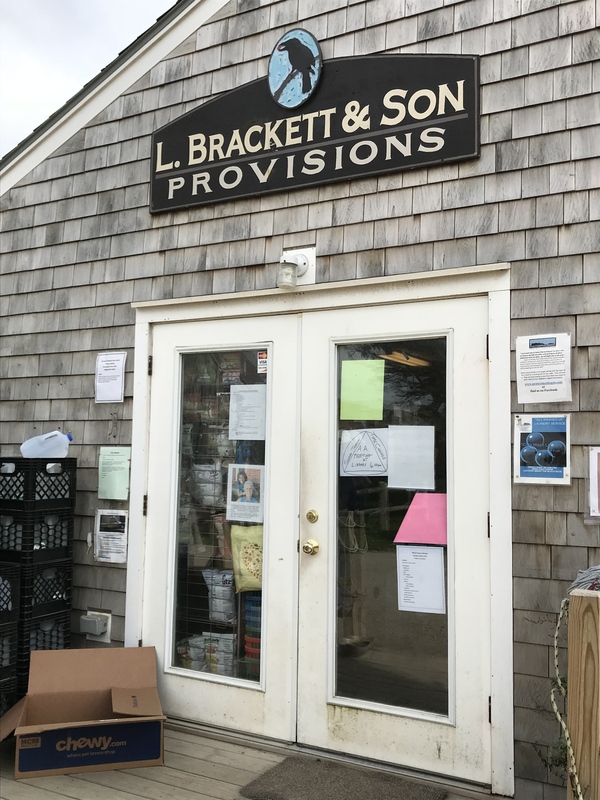 The owner of L. Brackett & Son Provisions greeted us, handed over a mug of steamy goodness and welcomed us to Monhegan. Never has a breakfast tasted better: fried egg on English muffin eaten while perched on stools at a two-seater counter. 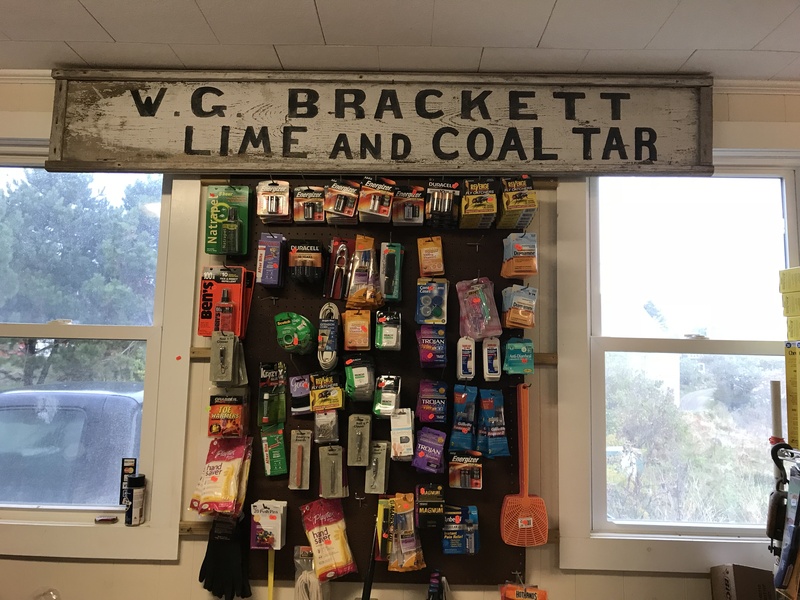 Monhegan’s General Store, home of hot coffee and breakfast sandwiches! Too early for us, but definitely in demand we suspect. Other downtown establishments were closed for the season except for the U. S. Post Office. Now, if only we could have found a postcard to buy . . .
At the pinnacle (literally and figuratively) of the island stands the last creation of architect Alexander Parris, the 1850 structure known as Monhegan Island Light. And we, standing among the buildings that comprise this hilltop assemblage, felt that we had been incorporated into an Edward Hopper painting: stark white boxy shapes topped with reddish roofs casting long shadows at both sunrise and sunset. Beside the buildings, an empty boat sits idle, reminiscent of busier times. And the buildings themselves, now operated as a museum, form a complex made up of the the lighthouse keeper’s house, a storage building, and oil house. The 47-foot circular tower built of granite blocks stands tall against the sun while light streams through the lantern house. At sundown — at least during October — you can catch a stark silhouette of the tower against an orange sky. For us, being alone atop lighthouse hill at sunrise watching daybreak over Monhegan remains one of our fondest travel memories. And seeing the tiny village below bathed in waves of sunlight and shadows was an experience we will never forget. 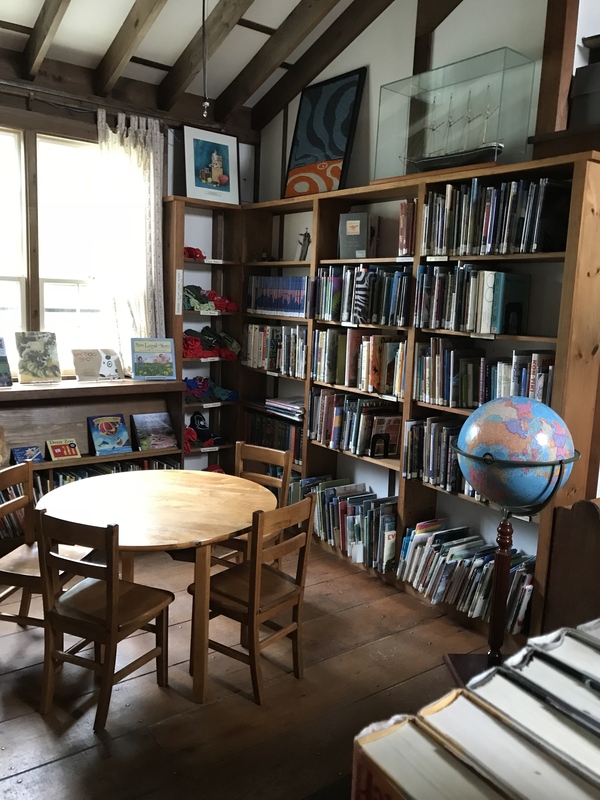 Of course, there are more good times to be had in Monhegan, ones that can only occur during busy times when people fill the inns and pack the trails and capture unspoiled scenery at every turn. But we were content with our solitary, yet brief, sojourn when we relished the quiet life on this heavenly isle. For us, Monhegan was magical — a land perhaps that time has forgotten. For more photos and posts on our month in Maine, check out Autumn Down East in the Travel Series bar at the top. 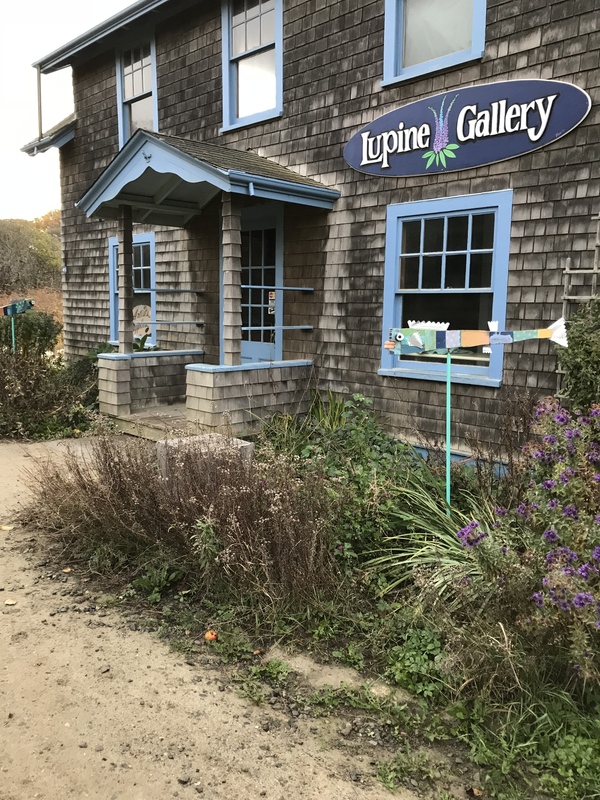 This entry was posted in Autumn Down East, Maine, Photography, Travel and tagged Jamie Wyeth, Lobster Cove, Maine, Monhegan, Monhegan Island, Monhegan Island Light, Shining Sails, The Island Inn. Bookmark the permalink. Thanks for the compliment. I’ve been wanting to put this post together for some time, but I had so many photos, it was hard choosing the right ones. If you get a chance to see Monhegan, please do. It’s one of the unspoiled places in the U.S. that has a charm all its own. Monhegan was doubly off season. But the few people we met — all year-round residents — didn’t seem disenchanted with us being there. Just sorta surprised. October was unseasonably warm, so we went. But I don’t know how they make it when weather is really, really bad. We were in Maine for a month, so we had the opportunity to travel around each day and see something new. 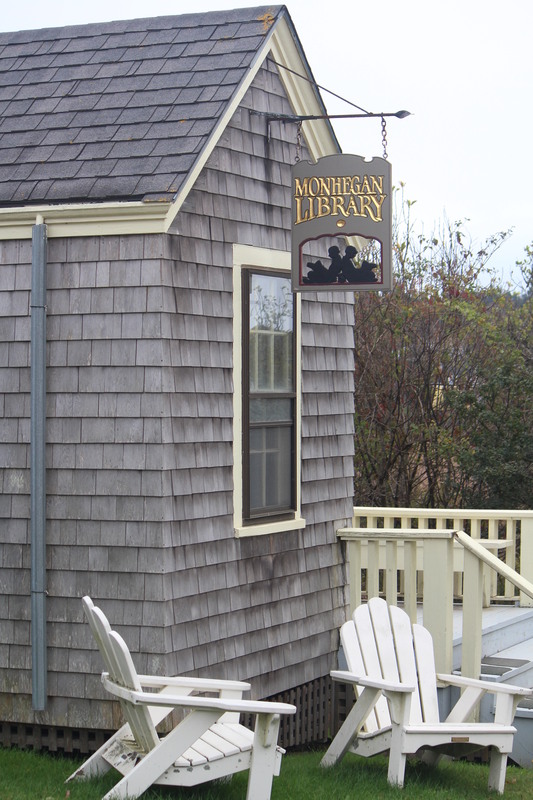 I’d love a week or two in Monhegan — with lots of books and art supplies! Our experience is that folks are usually nicer when not overwhelmed by tourists. Even the merchants who make their living off of them. This looks lovely!! There is something g comforting about getting to know a place! You should definitely go more often! I really think this is one place we may try to see again. It’s not all that easy to get there, but it’s also worth jumping through whatever hoops to see again. Thanks for taking a look. Thanks for the compliment! It was a pleasure to take pictures, and I have so many more. But where else was I going to find a place so unspoiled, so to speak? And then there are those ocean views, the great houses, the rusted traps . . . Thanks for taking a look at Monhegan. A nice place indeed! Wow to think that a place like that still exits! Why does everyone go away in the winter? It is amazing that it hasn’t been “refined.” And that’s what I love about it. If you take a look at the weather in Maine this week where they are experiencing their 3rd “nor’easter,” you may have an idea of why they shut down. I’m not sure how the folks on a remote island serviced by only one ferry a day make it through these winters. But somehow they do. More power to ’em! It would be a way to get away from things! I guess they stock up and have generators! Except for the lack of restaurants, it seems ideal. I’d like to be one of the regulars — you know, the people who come every summer for a week or two. That way, I could get to know the proprietors, the ferry guy, the grocery store clerk, etc. It’s really an ideal place for “getting away.” People seem to leave you alone . . . at least the five or so people we saw! Thanks so much. It was fun to take pictures, especially when no one was around. We don’t get to do that in a town very often. Appreciate your taking a look!